Originally uploaded by Andy Luke. Uploaded some pictures from a folder in the nineties. A few nice Implausability of Reason pics - one which inspirer danny_pongo has already claimed for his userpic. 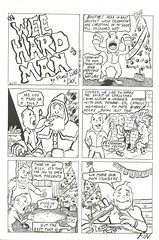 "Wee Hard Man" was the first joint comics venture I felt entirely satisfied with. Dek Baker really knew what I was on about.